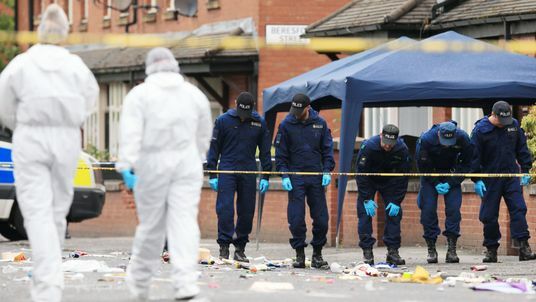 Police have launched an investigation into "attempted multiple murder" after 10 people were hurt when shots were fired overnight in the Moss Side area of Manchester. Police believe a shotgun was used in the attack, which left victims with predominantly pellet-based leg injuries. All 10 injured people - ranging in age from "late childhood to 50s" - were sent to hospital, among them two children with "pellet-type wounds". One man was said to be in a serious but stable condition with leg injuries. Police say one person has left hospital after self-discharging, and the remaining nine people with pellet injuries are expected to leave hospital on Sunday. Armed and unarmed officers were on the scene "within a minute" after a series of "bangs" were reported at 2.25am in Claremont Road. On arriving at the scene, they discovered a crowd of several hundred people who had been at Manchester Caribbean Carnival, some of whom had been injured and needed first aid. Chief Superintendent Wasim Chaudhry described the situation as "confusing" and "distressing". The carnival had brought large groups of people to the area, with several after-parties understood to have taken place in Claremont Road. The event - which this year is celebrating the 70th anniversary of the Windrush generation - is going ahead as planned on Sunday. Festival organiser Mike Bisson called the shooting "an isolated incident" and said it had "nothing to do with the carnival". Chief Superintendent Chaudhry called the shooting "a reckless act that could have had devastating consequences". He added: "Guns have no place on our streets and we want to assure you we are doing everything we can to find the person or people responsible."